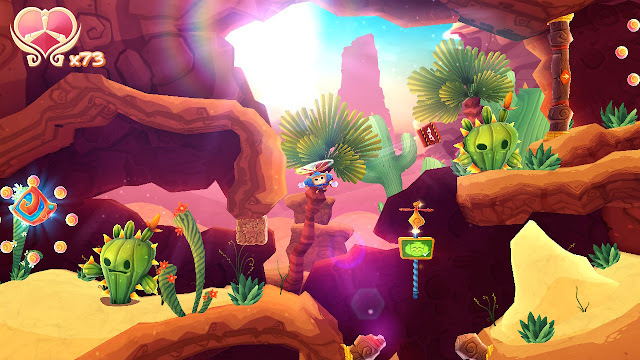 Releasing this Friday on the Nintendo Switch, the formerly mobile-only Heroki gets the review treatment this morning. Scope out why I wholeheartedly recommend the game with my review. Fun takes flight... this time on the Nintendo Switch. Over two years ago, I covered Heroki on my iPhone. The game was an absolute joy to play, and it reminded me of the classic types of gaming experiences that were offered by SEGA in the publisher's golden years. Now, Heroki is being self-published by the developer Picomy, and being brought to the Nintendo Switch. With analog and physical buttons being standard for this version of the game, Heroki manages to deliver and delightful time once again on an entirely new platform. 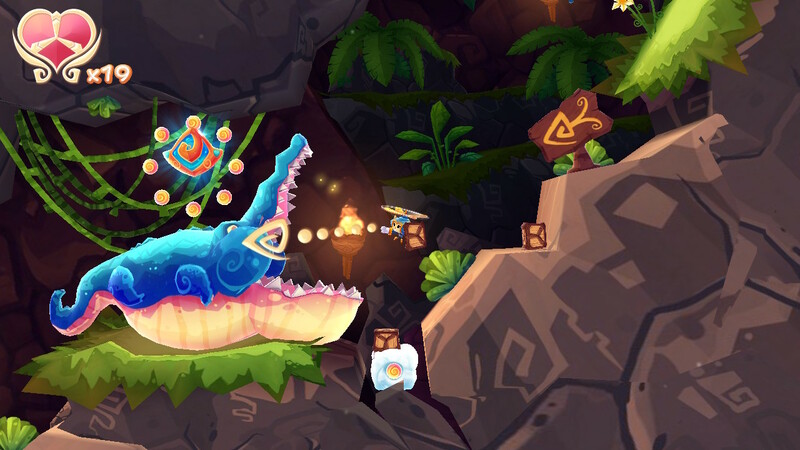 Heroki is a side-scroller where instead of running and jumping, our hero hovers and flies around the labyrinthine levels in pursuit of Emerals and other collectables, all the while reaching each level's goal. Levels consist of some mild and modest backtracking, usually comprised of hitting buttons to open gates and doors in other parts of levels. Checkpoint markers aren't overly common in levels, but since you're usually returning to past areas in levels, it's not as much of an issue. This is because when you activate one checkpoint and then activate another, the most recent checkpoint is the one turned on while the first one returns to its original state. This means you can return to the first checkpoint to reactivate it and it will serve as your place to continue if Heroki's perishes mid-flight. In theory, you can merely switch between activating a level's two or three checkpoints to constantly record your progress in a level. Take aim, Heroki, and then bash that enemy with that box! Our hero doesn't have the strongest disposition to him, so Heroki has other means to take out enemies that stand, fly, hover, etc. in his way. Heroki can carry boxes and boulders, transport them through levels, and by holding the throw button, he can aim where he wants to chuck his cargo, in a fashion similar to Yoshi's egg-throwing in Yoshi's Island. Many times it's to smack a box or boulder into an enemy to defeat the dangerous creature blocking Heroki's way, but other times it's a TNT box to throw at a destructible wall or to carry crates from one section of a level to another to weigh down a switch. Heroki also has the ability to quickly descend, sometimes used to avoid pursuing enemies or hazards, while used more frequently to bash through clouds platforms which can block his progress. Oh, it's no joke. This frog is about to croak. 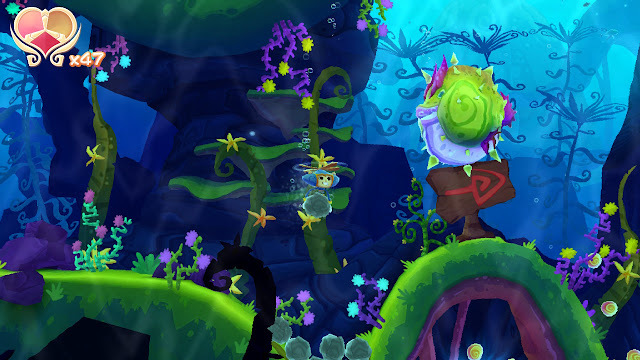 In each level, there are five Emerals to collect, and these are the most important collectable in the game to gather, as at the end of each world, of which there are three with eight levels each, it's required of you to have a specific amount of Emerals in order to progress onward. It wasn't a roadblock for me, as I personally enjoyed going through Heroki's levels and thoroughly exploring every corner and area possible, but if you're merely rushing from the start of a level to its goal, not only will the adventure be a breeze but you also will have to return to levels to get more Emerals to proceed to the next world. Understandably, this can get quite irritating when you just want to get to the next world, destroying the pacing of Heroki in the process. "The better to guard this Emeral with!" Other than Emerals, levels in Heroki have two others types of collectables. One of these are six gold letters that spell out HEROKI, as well as a hidden treasure chest that contains anything from more currency to special presents that show up in Heroki's home back in the hub town. Everything is hidden well with plenty of secret alcoves and areas in levels that require you to keep an eye on your surroundings for suspicious-looking walls, floors, and ceilings. In order to 100% a level, you need to get every Emeral, spell out HEROKI, and find and open the treasure chest in one run. It can be vexing occasionally, as sometimes you're gated from returning to past parts of levels, meaning you're potentially locked out of a perfect run. Regardless, 100%-ing a level is merely an optional task to create more replay value in Heroki's relatively short campaign. Heroki is about to make sure this particular puffer fish puffs up for the last time. Outside of Heroki's 24 levels, the game has a hub town where you can do a variety of tasks and small quests for its denizens. Since there aren't any achievements in the Switch version, doing most of the quests in the town doesn't really serve a purpose other than earning lives and more currency, which is a bummer and confusing why in-game achievements didn't travel over from the iOS original. 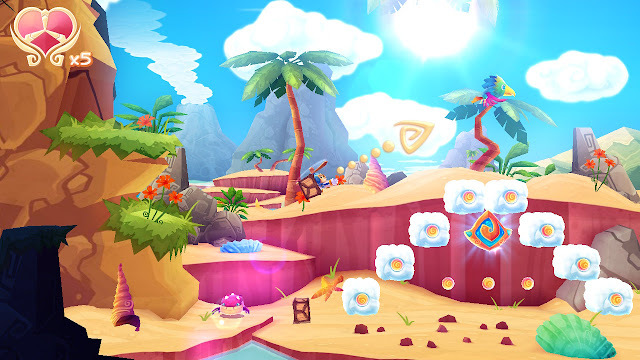 Currency collected in levels can also be used to purchase a wide assortment of items, such as lives, power-ups, and even new colorful trails that follow Heroki upon flight. The ability to use an actual analog stick and physical buttons on the Nintendo Switch version of Heroki instead of touch controls like the mobile version makes it so there's a greater sense of precision in Heroki's movements. Touch is still possible for menus, but for everything else, there's more accuracy in using analog controls. Well, that's save for using a power Heroki learns after the first world, where holding down the X button allows the player to draw a line of any type on the screen to activate a gust of wind. There aren't too many calls for precision with this power, but when there are, the speed at which the cursor moves in addition to how imprecise the analog movements are make for a more difficult control setup than what was originally found in the mobile version. Trying to push a ball through a curved passage by guiding it through with gusts of wind can be an effort in utter frustration. Heroki is a gorgeous game to look at, and part of that can be attributed to the jaw-dropping lighting on display in the game. Flying through a vine-filled vista while in the distance, the sunlight peaks out through a flower in the background is just an amazing sight to behold. Heroki is a beautiful game, and it manages to stay a relatively steady frame-rate the entire time as well, which is a great bonus. 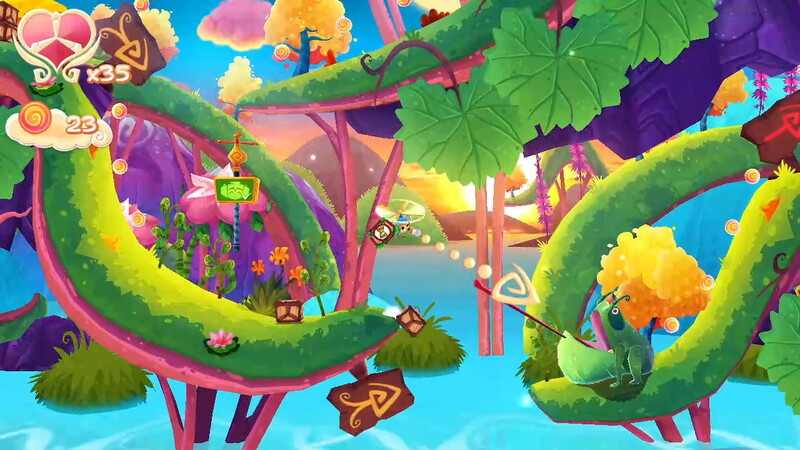 The music is suitably catchy and gels well with the flying, floating, and box-toting gameplay Heroki possesses. Alley-oop! This cactus enemy is about to have a blast--literally! 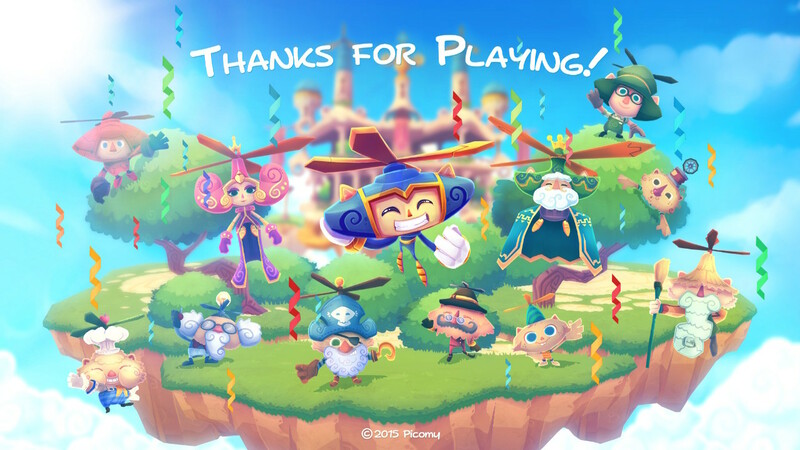 While the analog controls bring both a blessing and a curse in some regards to Heroki, it was an absolute pleasure to return to Picomy's game with the Nintendo Switch version. The lack of in-game achievements cuts away some of the game's longevity, and locking progress behind collecting Emerals can be a bit of an annoyance if you aren't already hunting for them. That notwithstanding, for its relatively inexpensive price and the amount of entertainment I got from the game, Heroki takes flight and soars high with one immensely enjoyable game. Review code provided by Picomy.